My oldest at not even 8 considers himself a "gamer" like StampyLongNose! That totally cracks me up because he is only allowed 30 minutes a day during weekdays to play, and that is only if he earns the time. He earns the time by either reading books (15 minutes per chapter) or my cleaning, or doing some extra math practice online. You can imagine how much he dislikes all of these, so I try to get him interested reading materials that he does not mind. This often means "gamer" type books. We were lucky enough to receive Trouble in zombie town: The Unofficial Minecrafters Adventure. After receiving this book, he has regularly been earning XBOX time and not giving me a hassle about reading! I just love that I have been able to find a book that actually interests him! I've purchased books about every subject that he showed interest in, and the books about his favorite games are by far his favorite. Gameknight999 was sucked into the world of Minecraft when one of his father’s inventions went haywire. Trapped inside the game, the former griefer learned the error of his ways. He transformed into a heroic warrior and defeated powerful endermen, ghasts, and dragons to save the world of Minecraft and his NPC friends that live in it. While he sometimes has me play Minecraft with him, I definitely do not understand it, and even find myself not knowing how to walk. While I do not understand his fascination, I do think it is a great game that stimulates his brain and imagination, and I love that we can incooperate his favorite into a passtime he does NOT enjoy, reading. He was really excited to receive this book and actually pointed out that he had read other titles by this author and very much enjoyed them! For a boy that hates to read, at seven, he finished this book within a week! 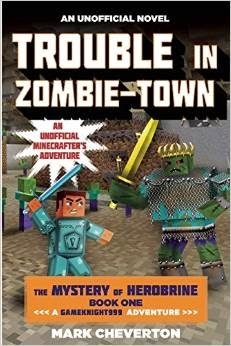 I highly recommend Trouble in zombie town: The Unofficial Minecrafters Adventure if you have a elementary aged child who loves Minecraft! Reading is great. This seems harmless enough. I don't know what it is, but it looks cute.